Changes to Canada's arms export policy to prevent weapons from falling into the hands of human rights abusers won't mean an end to a controversial contract with Saudi Arabia, Foreign Affairs Minister Chrystia Freeland said Thursday. Opposition MPs and rights advocates panned Freeland's update on Canada's proposed legislation to join the United Nations Arms Trade Treaty, which she provided during long-awaited testimony at the House of Commons foreign affairs committee. Her testimony was a response to groups such as Amnesty International, which previously have urged the committee to amend the bill to close a loophole they say would allow Canada to sell arms to the United States. They argue the bill contains no assurances the weapons could not then be transferred to countries that abuse human rights, including Saudi Arabia. "Concerns remain that Bill C-47 will not apply to arms sales to the United States and does not tighten the scrutiny of arms deals involving the Canadian Commercial Corporation or the Department of National Defence," Alex Neve, Amnesty's Canadian secretary general, said in a statement following Freeland's testimony Thursday. The New Democrats, who are pushing the government to amend the bill, said Freeland's plan does not live up to the spirit and letter of the treaty, which aims to regulate the trade in armaments — from handguns to tanks. "It's very well to say Canada is going to accede to the Arms Trade Treaty, but the Arms Trade Treaty is very specific that if there is new evidence that comes up, you need to suspend your exports," said Helene Laverdiere, the NDP's foreign affairs critic. "But everything they're doing is contradictory to some basic tenets of the treaty." 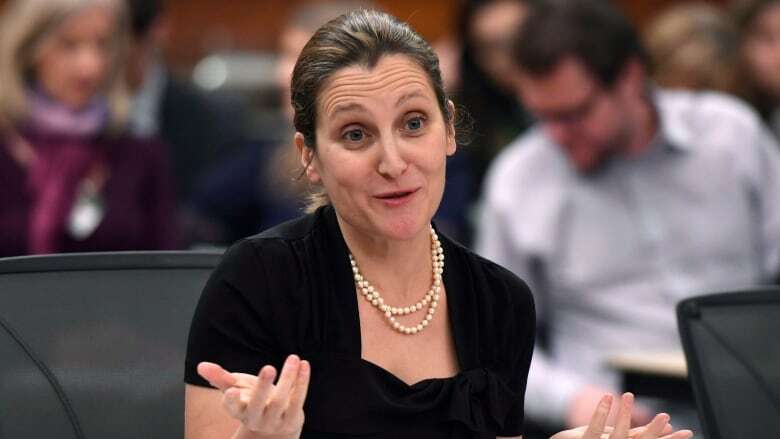 Freeland said she was concerned by media reports that Canadian-made light-armoured vehicles sold to Saudi Arabia were used to suppress that country's Shiite minority. 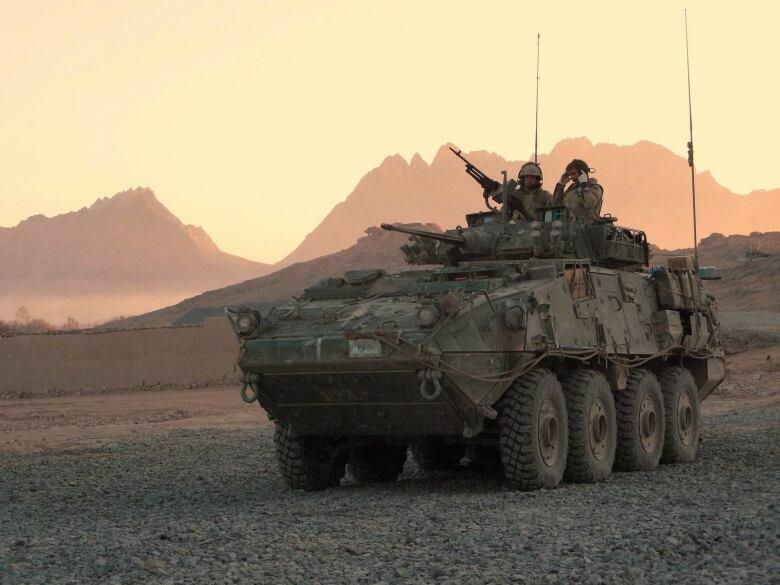 The previous Conservative government negotiated the $15 billion contract between Ontario's General Dynamics Land Systems and Saudi Arabia in 2015, but it was the Liberal government that followed through by issuing export permits in 2016. Freeland said her department, after conducting a "rigorous" examination, "found no conclusive evidence that Canadian-made vehicles were used in human rights violations." Nonetheless, she informed the committee that the government has added a "substantial risk clause" to Bill C-47 to prevent future arms exports to countries where there is a "substantial risk" of rights violations. But there is one caveat: "Canada will honour, to the greatest extent possible, pre-existing contracts." Freeland said Canada's word as a "trusted partner" in international negotiations has to be protected. Amnesty International said it's good that Canada is finally planning to join a treaty that the previous Conservative government had rejected, but it is disappointed the Saudi deal will stand. "Honouring contracts is no defence to or justification for action that may lead to serious human rights violations," said Neve. Freeland also told the committee that "serious challenges remain" in dealing with "unconventional" U.S. proposals in the ongoing NAFTA negotiations, including U.S. demands to open up Canada's protected dairy sector. She said Canada has put forward "creative ideas" to resolve outstanding issues on autos and the investment dispute resolution mechanism, and continues to pursue a "fact-based approach" to the negotiations. Her testimony came amid reports of growing U.S. frustration with Canada. A congressman who was among lawmakers briefed by U.S. Trade Representative Robert Lighthizer this week said the trade czar was frustrated with Canada and was considering concluding a quick agreement with Mexico before dealing with Canada. Lighthizer later issued a statement reiterating his commitment to the three-country continental accord. Lighthizer expressed dissatisfaction at the end of recent NAFTA negotiations in Montreal over some of Canada's proposals, calling one of them a "poison pill." He also accused Canada of launching a "massive attack" on the U.S. trade system by filing a detailed complaint about punitive American trade practices to the World Trade Organization in December. Earlier this week, Ontario threatened to introduce legislation that would allow it to retaliate against U.S. states that adopt Buy American policies.